Apothia will launch Pearl, a new fragrance for women, this coming March. Pearl is meant to honor the brand's 30th anniversary, and to be a versatile, day-to-evening scent. 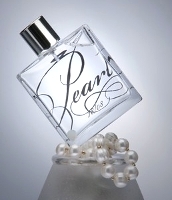 Pearl was developed by perfumer Stephen Nilsen; the notes include shiso leaf, plum blossom, yuzu, peony, pink jasmine, honeysuckle, orris, warm golden amber and ivory musk accord. Cool bottle, know nothing about the line. Not encouraged by the “day-to-evening” idea, though. My idea of “day-to-evening” is Montale Grayland, but that's probably not theirs. Shiso is just about my favorite smell in the entire world. Hoping the jasmine doesn't take the whole thing over. I liked Velvet Rope & L. This one for some reason doesn't sound quite as appealing, but I'd like to try it. Do you have a favorite shiso perfume? What does Shiso leaf smell similar to? I am thinking crisp green note? Can you compare it to anything? I too, am hoping the jasmine won't take over. I wonder if it will be sold on lucky scent? Pearl is my birthstone, and I like it for philosophy's sake. Sounds VERY Promising! The Notes are all there for something rather Intriguing and Delicious! Hope it lives up to the promise of the notes! Supposedly crushed shiso leaves smell like lemon balm, but I've never smelled the “real thing”.